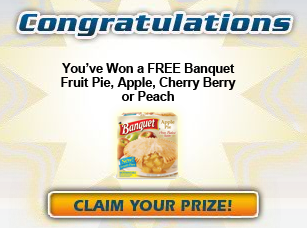 I just won a Banquet Pie from the Kroger Instant Win game! If you don't win today you can try once daily. (this was my third time playing) The prize is loaded onto your rewards card. I also won another giveaway!! Wahoo! That's 4 for me now, and this time I'm not showing the loot to my daughter so it can be a birthday present. :) It's my night! !